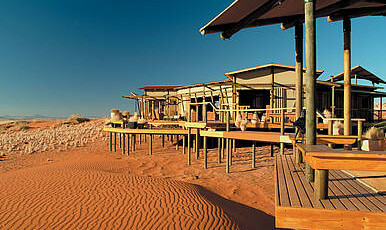 The Dunes Lodge is perched on top of a dunes plateau some eight kilometers north of the Dune Camp and overlooks panoramic vistas in all directions, capturing the desert in a most memorable way. The building style is a combination of wooden structures, large canvas blinds and windows that open up to the desert beyond. The lodge reflects the ambiance of a tented camp, but provides the comfort and protection of a permanent building. Each of the nine spacious Chalets with en-suite bathrooms leads onto a private veranda and vast stretches of untouched sand. Sleeping with your canvas blinds open is as good as sleeping under the stars. The main complex – which has completely been rebuilt during 2003 – consists of two lounges, a number of sun-downer decks, a fireplace, a tea deck, a library, the wine cellar and two dining rooms. All communal areas of the lodge open out onto verandas with superb views.